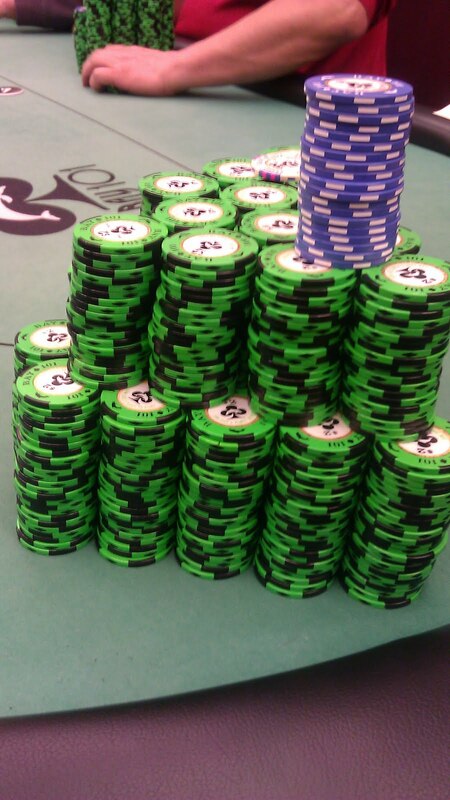 I last wrote about the 8/16 game at Bay 101 after a killer session where I cashed out 12 racks. This session wasn't quite as good (only 9 racks), but this time it was on my original buy-in. I was a bit of a card rack. I'm guessing I flopped a set about 50% of the time I held a pocket pair, and I netted a huge pot with pocket 6s on a board of QQ44 when I got called all the way with Ace high. On the flip side, I got my KJ-high snapped when my tilty victim called with KQ-high. It was a ballsy call and I congratulated him for it. He was on his 5th $200 buy-in and soon dumped all those chips back to me. I almost took a picture of him standing at the table looking at his last ATM receipt to see if he had enough for another hit, but I wasn't fast enough. The other day I posted a picture on Twitter of a large gentleman with "Sticks & Stones" tattooed on his arm. I left the pithy comment: "I'm told THIS can break your bones." I'm certain it was true. The dude was huge. Unfortunately, when I went to snap the picture, I forgot to turn off the flash on my phone, and he was all, "WTF, dude?!" I quickly recovered and showed him the neat flashlight feature of my phone and apologized for the accident, but it was sketchy for a bit. I thought I was going to be testing the whole bone-breaking feature of his forearm, and that was not what I had planned for my Monday night. Back to the Bay 101 - I really tried hard to put folks on hands and was able to loosen my starting hands quite a bit. Still, it's a bit of a crap shoot when there are 5 or 6 to see every flop. I got a huge kick out of the fact that a couple dealers stopped by after their down to check on my progress. It's nice to book a win. Learn how to get more bonuses, tournaments and actions for players at Paddy power casino online . Join now and start winning with us!